Do you have problems with formatting your HDD or USB flash disk .Download All software versions of HDD Low Level Format Tool " v2.21, v2.36, v4.25 and v4.40 and erase your data forever plus repairing your HDD sectors . HDD Low Level Format Tool is a free software has been programmed by hddguru Software .HDD low format tool can perform low level hard disk format also you can format any corrupted USB Flash drives that can't be formatted by HP USB Disk Storage format tool or any other format software .HDD Low Level Format Tool file has been tested with Node32 ,Kaspersky and other antivirus to be sure that there is no virus or any malicious software . HDD Low Level Format Tool software can repair hard disk sectors and clear partitions ,MBR and all data inside the hard disk for ever .HDD low level format software support the following operation system "MS Windows XP, Vista, 7, 8, Server 2003, 2008, 2008R2 " .You will find 4 software versions you can set up HDD Low Level Format Tool on your PC or you can use the portable version without setup .IF you will use this software as commercial use so you must buy a license , please visit the official website of hddguru . Be careful after formatting your USB flash disk or HDD by using low level format tool , all data will be fully and irreversibly erased , this means you will never be able to recover data again by using any data recovery software . First you must download any version of HDD low level format software , i upload 4 different version , you can download any one you need .Download links in the end of this article .I will explain the latest software version of HDD format tool "V 4.40 " . Insert the USB flash disk or HDD that you want to format to your PC . 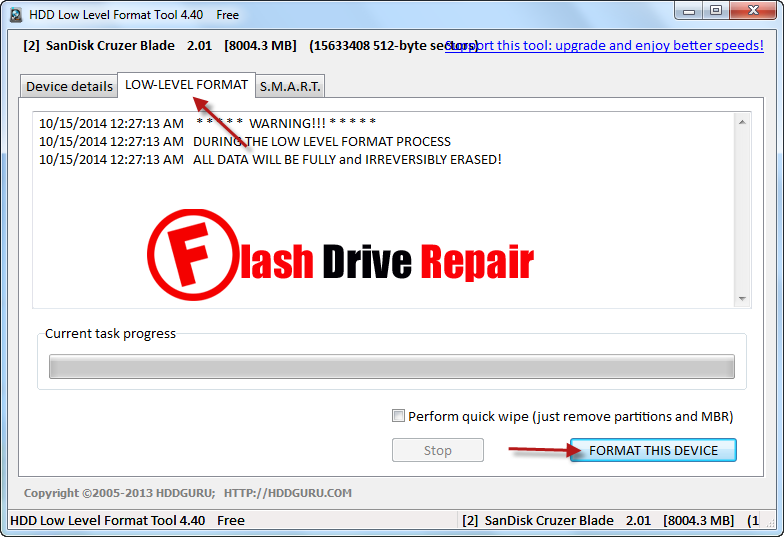 Extract HDD Low Level Format Tool v4.40.rar and open portable HDDLLF.4.40.exe . 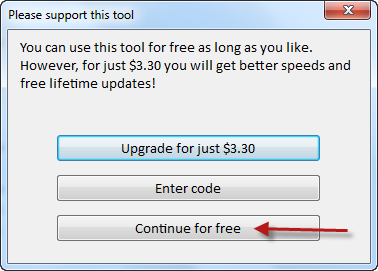 Click Continue for Free . I will format my Sandisk Cruzer USB flash drive ,So please choose your USB flash disk or external HDD or Memory card then Click Continue . Wait until finish the deep format . Please if you like this article , please share it with your friends . Bro i have 4 crrupted micro sd cards which are 2gb and one 8gb how to fix them problem is they are not showing in pc i am using window7 home. I am also using card reader which is fine.These micro sd showing in phone Nokia E66 symbian s60v3 when i try to format them it give pop up message this devise is in use by other application. After that same "memory card is crrupted"plz guide me what should i do?